Karaoke is a phenomenally popular pastime in Japan. Really, it’s not hard to understand why. 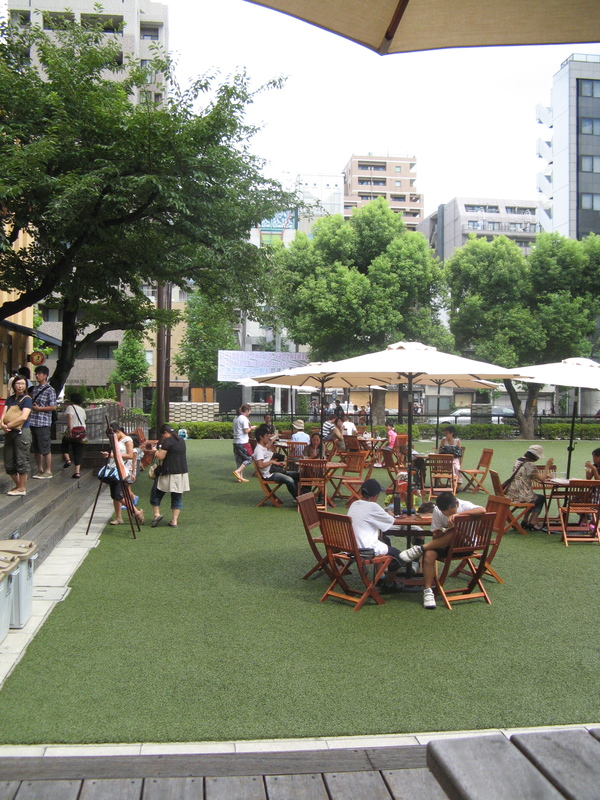 Just think about that most famous of world intersections at Shibuya, the mass of bodies that makes London seem quiet and bucolic in comparison is in a way Japan personified… albeit many times over. So how does Karaoke fit into this? Karaoke in Japan can be as private or as social as you want it to be. This is because big Karaoke places have rooms, or boxes as they are sometimes known, where one can sing alone to your hearts content or in the company of friends. Thus allowing both a rare opportunity for privacy or the ability to limit your potential humiliation to a handful of friends or sufficiently drunk co-workers. Also, it’s liberating. While every other aspect of life in Japan may require a level of conformity and groupthink that some of us in the west might baulk at, Karaoke is about letting go of these constraints. You can be salary man by day and J-Rock star by night if that’s what you want to be. It is a sense a way to recapture your youth in a big way. We all like to think that we’d sing something current, up to date and unassailably cool. But the truth is, that when the beers are stacking up something of your true and once youthful self emerges and unlike in High School, it isn’t shy. My litany of crimes to music within the confines of a karaoke box are now many, including my own attempt at doing Sad Kermit’s version of the Nine Inch Nails classic Hurt as covered by Johnny Cash, various 1980’s rap numbers and the odd *cough* …Springsteen classic… though strangely I regret them not. Now I’ve been so often I’m beginning to develop minor pet peeves. Mainly that the aging Karaoke videos for any english language songs are a montage of 1980’s Europe, so when midway through singing any song you are likely to be confronted by the horror of a permed woman attempting to solve the same crossword over and over and over again, amid a sea of London Buses, just before a flood of images rotating around the leaning tower of Piza, before finally falling to despair and plummeting into a belly laugh at the sight of San Francisco tram cars. It wasn’t long ago that the thought of Karaoke made me chuckle and wince in equal measure, but slowly bit by bit, inch by inch its grown on me. Like some airborne virus it’s caught me off guard. Passed unnoticed into my bloodstream and set up shop and worst of all it’s a fan of The Vapors. My first experience of manga in Japan was not the best of introductions. I used to teach three boys, aged about eleven or twelve, at that annoying age where suddenly everything they liked two weeks ago is no longer cool. But one thing spans the gap from childhood to teen hood to adulthood like no other in Japan and every week, before their lesson started they would go looking for it. Looking for it, just so you know, is my polite way of describing a deafening cacophony of tweenage screams and yelps that oscillated wildly between glass shattering and the noise an old man makes when getting out of an overly plumped sofa. Punches would be thrown, they’d scratch like a cat fighting for a fishbone and all this would be before they’d even collapsed through my office door. Every bit of chaotic energy they possessed was directed in a desperate attempt to be the first to one particular drawer at the base of the office bookshelf. For you see, that’s where they kept their treasure, their manga. And when all the fighting was done, all the scraping, scratching, yelping, poking, picking and pinching, they’d lay on the office floor, all in a row with feet bobbing in the air reading the damn thing together. Turning pages at a frantic pace and utterly silent, a peculiar calm would descend over them, almost as if someone had just slipped them a sly sedative (note: I’d be lying if I said I’ve never been tempted to do this, but frankly I find making language games very active e.g. endless racing for flashcards, has a similar effect without the high costs and danger of prison time associated with drugging your students). Soon after though I saw the side of manga and Japanese Anime that often draws raised eyebrows in the rest of the world. Having taken the magazine off the boys as they tried to read it during the lesson I had quick flick through the enormous tome and stumbled across a picture of a young school girl, with Barbie like impossible curves, half bursting out of her uniform and staring down in shock at her now quite see through underwear having somehow spilled a large bowl of spaghetti on herself. However, to take Japanese comic book culture on such a small sample would be to ignore an enormous amount of history and tradition in an art from so popular, that to dismiss it based on this small sample would be foolish… or baka gaijin/stupid foreigner. 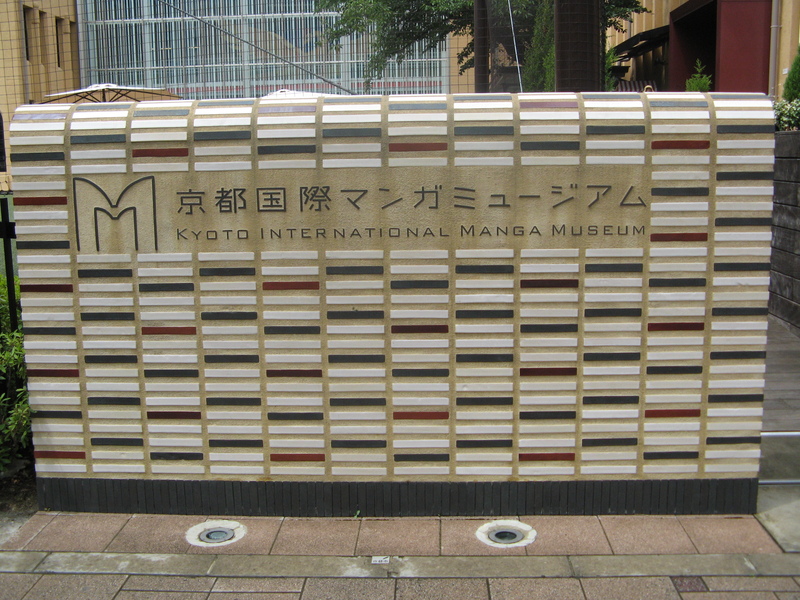 So the last time I was down in Kyoto I took a trip to the Kyoto Manga Museum. It wasn’t quite what I expected. Granted it was as quiet as most museums as the people within focused with great care on their respective subjects. Yet, this was no ordinary museum. Rather it blended the best elements of a library, a museum and a truly public space. One that was as much for tourists as it was for locals, children and adults or pretty much anyone with a passion for Japan’s favourite art form. The Kyoto Manga Museum was formerly Tatsuike Primary School and much of the feel of a school still pervades the place. Granted the Astroturf out front problem helps to a large extent, but the museum’s long creaking corridors, lined completely with an astonishing amount of manga gives the place a peculiarly appropriate feel, as if a konbini magazine rack (Japanese convenience store) fell into an old school house. It’s an odd mix, yet seems somehow to me to be matched perfectly. It captures both the childlike quality of comics themselves, in that they offer an escape into an imaginary world populated by creatures from our school day imaginations and just occasionally our more… shall we say wayward, teenage imaginations. It also places the comics in the locale where the frenzy my very own students illustrated was in all likelihood fostered. Now while the museum was a truly impressive place, having a long list of special lectures on its calendar, some beautiful displays and a good introduction to manga for novices like me, what amazed me most was how well it functioned as a library. I should probably note at this time that I once worked in a library, so I’ve seen it at its best when it acted as community hub offering homework help clubs to kids and great resources for the local community to add to their CV while continuing to fulfill its basic remit with ease. However, I have never, ever seen a library like the Kyoto Manga Museum. Every bench was full and not just with kids, but an almost perfect cross section of Japanese society. The reason for this is that the Museum offers a year long membership, so you can wander in almost any day of the week, find (if you feel so inclined) the best manga from 1972 and drop yourself onto a bench for as long as you wish. As public private partnerships go, the museum is an outstanding example of how it should be done. In as much the way as British rail service and any construction undertaken by Jarvis in the UK is a prime example of how not to do it. Now when I say perfect cross section, I really do mean it. Manga covers pretty much every part of society. In their pursuit of profit manga magazines have tried to cater for all ages and both sexes. Although, in the end they discovered that manga aimed at kids was being read by adults, ones aimed at women are read by men, while pretty much every combination imaginable is read by someone completely unexpected as well as their aimed for demographic. One variety of manga, I have however found deeply disappointing. Sporting manga is huge and supposedly encapsulates the Japanese spirit in a way that samurai and warrior tales used to before the end of World War II. Every moment of any sport depicted is a heroic struggle; emotion pitched at either end of the spectrum, highlighting just how much sport is more than any mere game. Thanks to its popularity almost every sport has received such a treatment; baseball, volleyball, football (soccer for those who don’t know better), rugby and any other sport you can think of. The Naked Festival and Premature…ahem, Exploding. Every now and then in my sleepy little town the quiet reverie and still countryside air is pierced with an almighty thump, like a cannon ball being launched headlong into the mountainside. It can happen day or night; I’ll be in my apartment, walking to the shops, in the office, in my classroom and from nowhere will come a sound like thunder, without a drop of rain in sight, without even a hint of that audible crackle in the air that precedes a colossal downpour. Because there is nothing natural about this deafening rumble that echoes off the mountain chains, it comes instead from a local addiction. A pastime and hobby the local folk hold close to heir hearts. Well not too close…because their hobby is explosive. Their addiction is to the fire flower, the rather beautiful literal translation of hanabi or in English fireworks. No you didn’t misread the first paragraph nor did I mistype. They do have an odd tendency here for performing test runs on their fireworks during the day even. One such test scaring the crap out of me when set off in a back garden I was just twenty-fifty feet from whilst enjoying a lazy stroll to the local bakers one sunny afternoon. A plume of barely visible smoke and a faint ringing in my ears being the tell tale signs of a local individual indulging somewhat too early in the day in their chosen explosive fun. For me, fireworks conjure up thoughts of crisp, cold nights in a park somewhere, neck craned up at the clear night sky, ears frozen and mug of plastic tea in hand. An effigy of Guy Fawkes should preferably be burning on a bonfire nearby and the smell of fried onions and cheap burgers ought to fill the air. 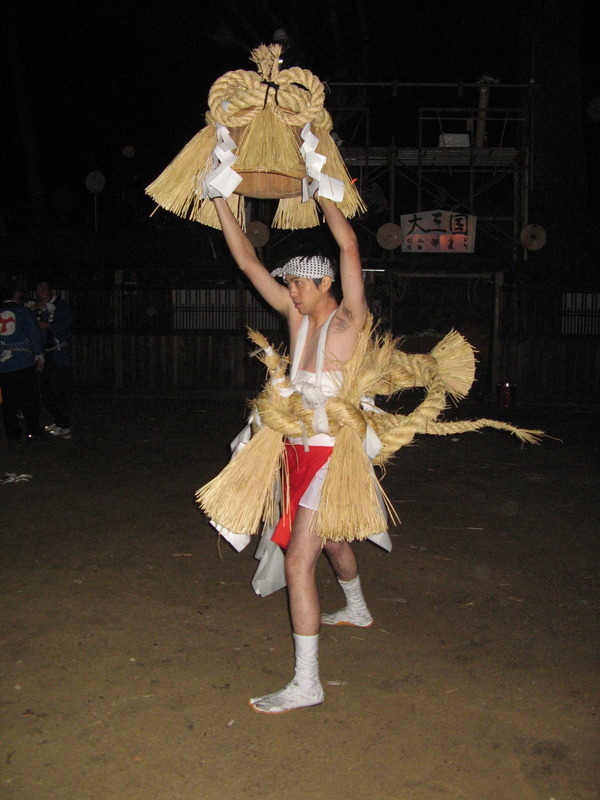 However, in Nagano, it’s a little different. Fireworks are generally part of the summer festival season and so a cold beer on a warm summer night is the more likely accompaniment to a quite epic display of explosive beauty. Towards the end of this season I was lucky enough to be invited along to my student’s local area festival, a short thirty minute drive from my place, to take in what is known as the naked festival due to a single representative of each village wearing virtually nothing but a piece of cloth to cover a hint of his modesty while holding above his head a rather heavy 25kg weight. This chap was soon followed by men of all ages, in groups of two or four, holding onto a large barrel or piece of wood launching all their effort into pushing the guy holding onto the other end of said block as far backwards as possible. In the course of this traditional outburst of locally cultivated, shrine located violence a little old lady or two were knocked over, some grown men picked up some scraped knees and a collection of elderly bespectacled salary men got very drunk indeed behind the event’s announcer, leading to some fairly amusing drunken background noise. Yet, as amusing as watching grown men fling themselves about with no apparent thought for their safety can be, it wasn’t what had brought out the majority of the crowd that night. No, that would be the fireworks. Which would be a simple enough incentive one might think, but there was an added twist. Each of the six, yes six, individual displays had been bought and paid for by different neighbouring villages as something of a friendly competition to outdo one another. 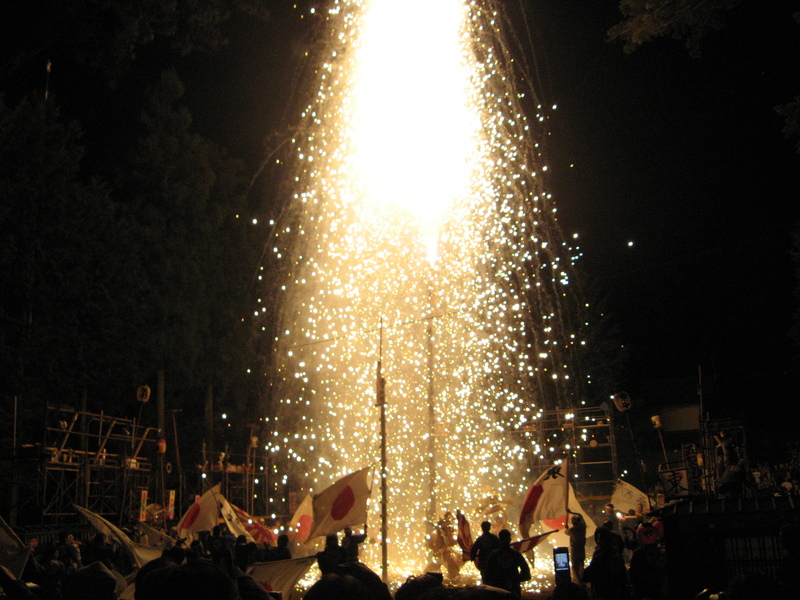 Each village began their display with some firework writing that would reveal the name of their villages in Kanji. After that they did as they pleased… and it kind of showed. One very cool feature of Japanese fireworks displays is the kind of mousetrap-esque way they set off fireworks. One firework will run along a path, ignite the next and so on. One such firework launches vertically up a pole on its own steam and then explodes dramatically upon reaching the top of said pole, a safe distance from the crowd. That night, four of these fireworks exploded prematurely at around head height. Safe we all were, but rather deafened for a moment each time. More and more I began to see how precarious these celebrations could be and perhaps why so many people in Nagano are volunteer firefighters. The finale at these events always looks amazing and this little festival was no different, one of the dramatic yet dangerous poles was lit once more and this time went off without a hitch. The danger entirely understood and quite gleefully ignored as men danced, waved flags and generally displayed just how tough or insane they are beneath fiery rain. It did look incredible though. I’ve had some peculiar moments in Japan (as you have no doubt noticed already) and they have almost always come from the kindness of strangers. Now I’ve never really addressed why they are quite so kind before, but indeed there is a simple reason for it; more often than not, I travel alone. I noticed as far back as on my trip around America with a good friend of mine, that a certain kind of person was simply more likely to attempt to engage you in conversation if you were by yourself. On some level you are simply more approachable. Also, the person about to randomly introduce his or herself might simply be more comfortable revealing their inner eccentric when in the presence of fewer people. Less potential embarrassment all round. The friendly brewer then proceeded to lead my friend and I through every stage of the brewing process. Embarrassingly, I was so pleased with this I hugged the tiny brewer while we were stood in the hops fridge. As we reached the end of tour my friend and I wondered, how could this get any better? So you see, I have much faith in the kindness of strangers, at least when said strangers have the opportunity to introduce themselves. Japan certainly hasn’t let me down in this respect. On my second trip to Shizuoka City to see a friend of mine, I found myself in need of a place to kill a few hours time and more importantly to get some grub in me. Not remembering the city all that well from my previous visit I attempted to wander in the direction of a hamburg restaurant I’d visited last time. Eventually, I tracked it down and found myself sat in a fairly empty slice of Germany, hamburg and spaghetti parked in front of me (some food combinations in Japan remain thoroughly beyond me). I was about half way through my meal when the only other customer, an elderly Japanese man started to talk at me. I say talk at me because I barely understood a single word of Japanese at the time, essentially any question asked of me that didn’t precisely match my text book was lost on me. But we persisted, each making efforts to bridge the gap, me with scraps of Japanese from my notebook, him through sheer bloody persistence. One question he asked was fairly simple, ‘do you like cake?’ I nodded. The next thing I know a slice of cake appears in front of me, courtesy of the kind old man. I thanked him once and then again as he was leaving, at which point he asked me, ‘Do you like tea?’ Once again I answered in the affirmative, not expecting another slice of generosity. I hadn’t realized at this point just how prepared Japanese folk always are for gift giving. Sure enough, he reached into his backpack and pulled out a brick of green tea, handed it to me, smiled and was on his merry way.